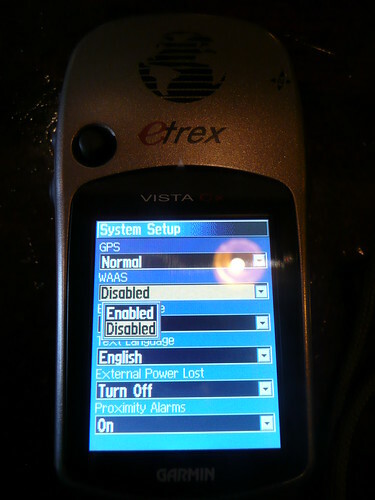 I’ve been using my Garmin eTrex Vista Cx GPS for six months. I use it when hiking and to geotag pictures. I noticed that I haven’t been getting the advertised accuracy level; the accuracy has ranged from 25 to 150 feet. A WAAS-capable receiver can give you a position accuracy of better than three meters 95 percent of the time. And you don’t have to purchase additional receiving equipment or pay service fees to utilize WAAS. What a deal! You just don’t get that out of the box — Garmin defaults WAAS to off. Once I turned it on, accuracy improved to 8 to 10 feet. Money. Computer manufacturers such as SONY and Dell lard up PCs with crapware like toolbars, trial versions of antivirus software and offers for broadband access. Companies like AOL, Google and McAfee pay for this distribution. It’s the price of cheap PCs. SONY recently received a lot of bad press for offering a “Fresh Start” option, which allowed consumers to buy select laptops without crapware for a $50 premium. Shelf appeal. TV sets are preset to look good on the big, bright showroom floor. These settings aren’t optimal in a smaller, darker environment. Support costs. Despite the fact that they all touted security as a key feature on the box, every wireless router I’ve had has come with security turned off. This isn’t the right choice for most users, but it is the one that will work out of the box and is least likely to trigger expensive customer support calls. Server capacity and operational costs. Gmail offers all users the ability to use a secure version of email, but defaults to insecure. Just go to “https://mail.google.com” and your entire session will be encrypted. Or use the Better Gmail extension to always force an encrypted session. The right choice for the user. Sometimes default decisions are actually based on what most users would want. Things like language, time display format and currency symbols frequently fall into this category. It’s hard to tell which of these apply in the Garmin case. Clearly, users wouldn’t prefer data that is more inaccurate, unless there was some downside to having more accurate data. I might take less accurate data if it meant I got more battery life in exchange. The Garmin owner’s manual is silent on this topic, although it does mention other factors that affect battery life such as backlight usage. WAAS requires more computation, so maybe it makes the unit slower? Again, the owner’s manual is silent on this. Garmin ignores the fundamental question I always ask when giving users a choice: does the user have the information necessary to make that choice? In this case, clearly not. There’s plenty of space on the Garmin’s screen (see picture below) to explain the impact of turning on WAAS. On the current generation Garmins, there is no discernible impact on speed or battery life with WAAS on. Which begs the question: if there’s no negative impact, why not have it always on and remove the option? Disclosure: I was part of the team responsible for AOL Toolbar distribution on SONY PCs. This entry was posted in consumer electronics, geotagging, gps, product management, ui, usability. Bookmark the permalink. Thanks! I will go enable this on mine as well now. How did you realize your data wasn’t as accurate as you expected? On one of the screens I have shows an accuracy estimate. I forget if that was by default of if I configured that. Maybe they didn’t show the accuracy in the first place to get around annoying people like me who expect technology to do what it claims!